Just recently I was looking through some of my favorite recipes for preparing fresh summer vegetables. I came across one for okra gumbo that my grandmother used to make. I must have been an extraordinarily weird kid to have liked okra. Still do, because Grandma’s recipe for gumbo was always made with garden fresh okra. “Delicious” really was an appropriate description. January through March are the very busiest months we have each year at Joshua Creek Ranch. By then many open hunting seasons have ended around the country and the weather is far too savage in certain areas for shooters to enjoy an outdoor adventure. So for those shotgunning enthusiasts who want to continue wingshooting during inviting weather conditions, Joshua Creek Ranch is a popular winter destination. 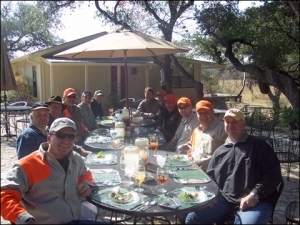 In years past, we’ve focused entirely on our hunting guests during these months -- never dividing our attention to include the hosting of significant sporting clays events during this peak of our hunting season. It’s no great intellectual leap to figure out which time of year is my favorite. Obviously it’s the autumn/winter/hunting season when the torturous temperatures of the Texas summer fade away to brisk mornings in the 40s, and delightfully sunny afternoons in the 60s. It’s paradise, and tends to stay that way for six to eight months. Not only does it feel like paradise, it looks like paradise. Historically rainy September gives a last burst of growth to the parched yet resilient pasture grasses that endured the hot summer. The upland bird hunting habitat gets better by the day until the first frost that typically comes by Thanksgiving. From then through the rest of the hunting season tufted tops of long golden grasses wave in the afternoon breeze, sheltering quail, pheasant and partridge till their scent is detected by the expert pointing dogs at the Joshua Creek Ranch. There’s a sound of paradise, too. It’s the “buzz” of the bird hunting business that resumes at Joshua Creek Ranch each October through March. The phone is ringing with requests for reservations, guests are arriving, shotgun blasts are heard in the distance, aroma of the fire pits fills the evening air, porch lights are flickering at all the lodges, and the dining room beckons the hunters with delectable presentations of quail, pheasant, and venison. What fun. It’s like a giant household with company coming and going all the time. 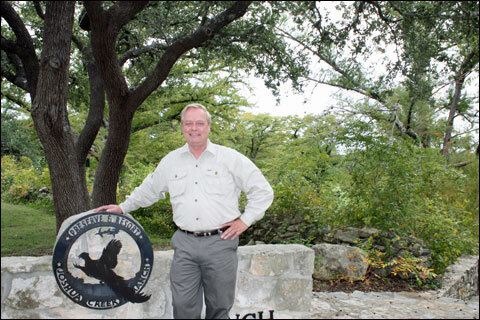 The new CEO of Joshua Creek Ranch, Rick Terry. This particular autumn/winter hunting season of 2013-14, I’ve got still another reason for calling these my favorite months of the year. A new chapter opened for Joshua Creek Ranch in November with the hiring of a Rick Terry as CEO to join our team of dedicated individuals. Rick’s primary objective: enabling Joshua Creek Ranch to raise its services to an even higher level of excellence. And there’s a secondary objective I’m equally excited about: enabling ME to focus on some things beyond Joshua Creek Ranch, like grandchildren, travel adventures with my husband, Joe, and taking time to enjoy this Ranch in addition to working at it. I won’t deny that it’s hard taking a step back from this business that’s largely consumed me for 25 years. And I probably couldn’t do it except for the encouragement of Joe and my confidence in the professional management and marketing expertise of Rick. But I’ll still have a role and it’s one that really lights a fire in me. You know the CEO’s primary objective I mentioned, the one about “raising the Joshua Creek Ranch services to an even higher level of excellence?” Well, I get to be involved in defining and developing the infrastructure for those services. In fact, we’ve already accomplished one of them that is serving our clients right now in this current hunting season. A seldom-used bunk bedroom at Cypress Lodge (our lodge where meals are served) was converted to a private dining/conference room. The flexibility that this opens to guests is fantastic. Couples can enjoy a quiet candlelit dinner in the main dining room while a group of hunters cheer their favorite college football team to victory in the private dining room. A corporate group can carry on a private business conversation over their meal while other guests dine jovially in the nearby comfort of the main dining hall. Exceptional services and facilities planning are underway as I write. New, high-end private accommodations are on the drawing board, as well as an extension of the sporting-clays course. A duck shooting scenario is in the works and hunting habitat improvements are in the making for spring 2014. The new chapter that’s opened for Joshua Creek Ranch is an exciting opportunity for our business, our staff, our members and clients, and for me as well. We’re ALL-IN for the plans we have to raise the level of excellence for services at Joshua Creek Ranch. There’s so much to look forward to! September marks the end of summer for most of us, at least according to the calendar. Wish someone would tell the Texas weather gods it’s time to show us some signs of autumn. We need a break from the heat and drought that tortures us every year about this time. Ever wonder why some people appear so relaxed and natural while they’re doing something that most of us would consider difficult? How their movements are intentional, yet graceful, with a fluid consistency that make the whole process of what they’re doing look easy? I usually think of artists and athletes in this context who have made their talent their profession…you know the painters, pianists, basketball players, golfers, ice skaters, ballet dancers …and, yes, champion shooters.